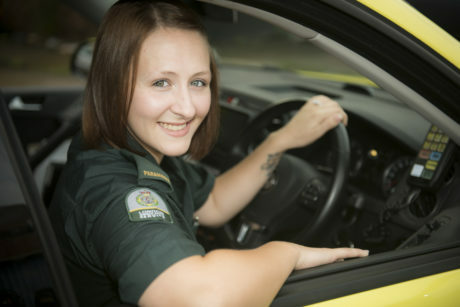 Kelly works for us as a Paramedic in North East London. She didn’t hesitate accepting the job as she says London is the best city to get great experience. I used to love watching all of the medical programmes like 24 Hours in A&E and really wanted to do something to help people. I was working as a carer in care homes and had worked with people with different disabilities and also spinal patients so already had experience of working in the medical field. What qualifications did you need for your role? I applied to study paramedic science at Plymouth University, but didn’t get in the first time. I got in second time round and completed the two-year foundation degree. I applied all over the country for a job and London was the first place to offer me an interview. Coming from a small town in the South West, it was daunting coming to London. The assessment day was intense – as well as a face to face interview, there was an exam paper and a lifting and advanced life support assessments. Less than half an hour later I got a call offering me the job! What’s an average day like working for the Service? I work in a car, so I’m often the first medical person on scene, which means I have to use my initiative and it’s really built up my confidence as a solo clinician. Working a mixture of 12 hour day and night shifts, a typical day involves getting to my base station in Hornchurch and checking over my car to make sure everything’s in working order. As soon as I let the control room know I’m ready to take calls I usually get one straight away and that can be anything from someone who has been in a road traffic collision to someone in cardiac arrest. Why do you work in the north east sector? What’s the job like there? I love working out of Hornchurch – the team is very supportive and it’s like an extended family. I didn’t hesitate accepting the job as London is the best place to get great experience – it’s such an amazing city. The diversity of the jobs we go to and people we see – you wouldn’t get anywhere else in the world. Being a paramedic has made me a stronger person and it’s given me a future. I’ve seen some difficult and sometimes horrible things, but I love my job and I can’t imagine doing anything else. I’m so happy I found my true calling early in life. Also, you get to meet some fantastic people – I even met my future husband here!